Though anyone close to me knows that I’ll cry at pretty much any sad film, novel, or plastic bag being blown around in the wind, there are comparatively few games that have made me well up. And while I have played a few games that have managed to make me do so, I’ve rarely been moved by a small, short game you can play in a browser. 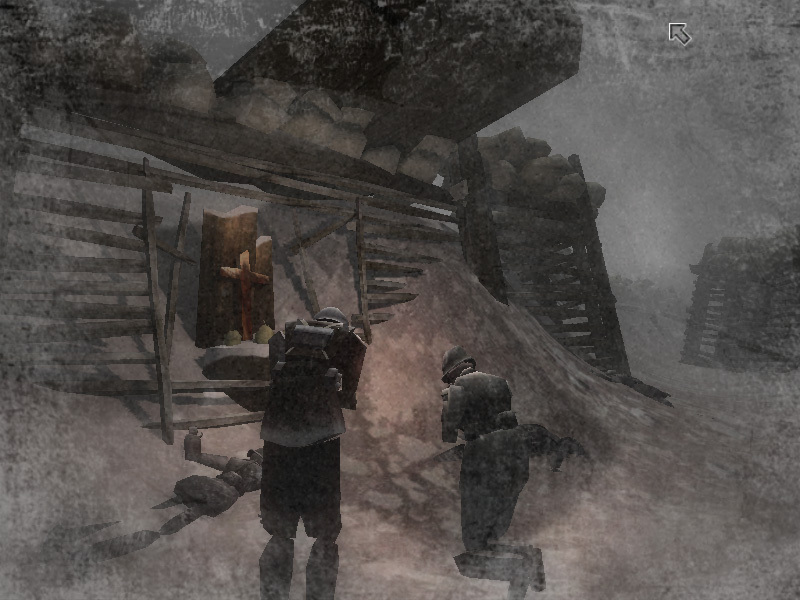 The Snowfield, a small, short game you can play in your browser, bucks that trend. And while it didn’t make me cry and then start coughing awkwardly to mask the fact that I was crying, it did do something to genuinely move me. It’s a short game set after a battle. 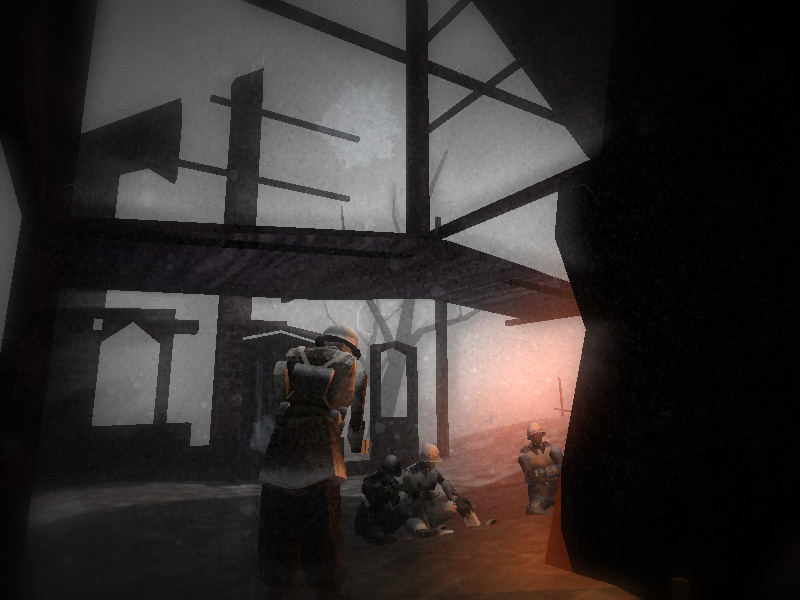 You play as a soldier, with nothing but your uniform, your helmet, and the unexceptional ability to freeze to death. Immediately it’s sombre, immediately it’s strange. You move about, and your hug yourself in the cold. Snow falls around you, and while almost nothing in this game is made entirely clear it’s made instantly and entirely clear that this has been a near-apocalyptic battle for everyone involved. Dead men lie everywhere, seeming to have crawled away and then frozen to death. 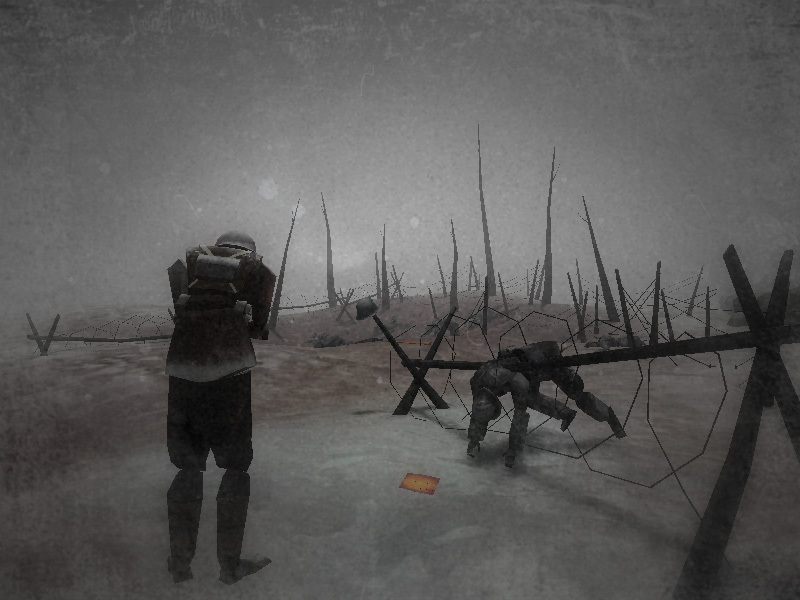 There is a broken structure just ahead, a bombed-out barn maybe, and you hunch over further in the cold. 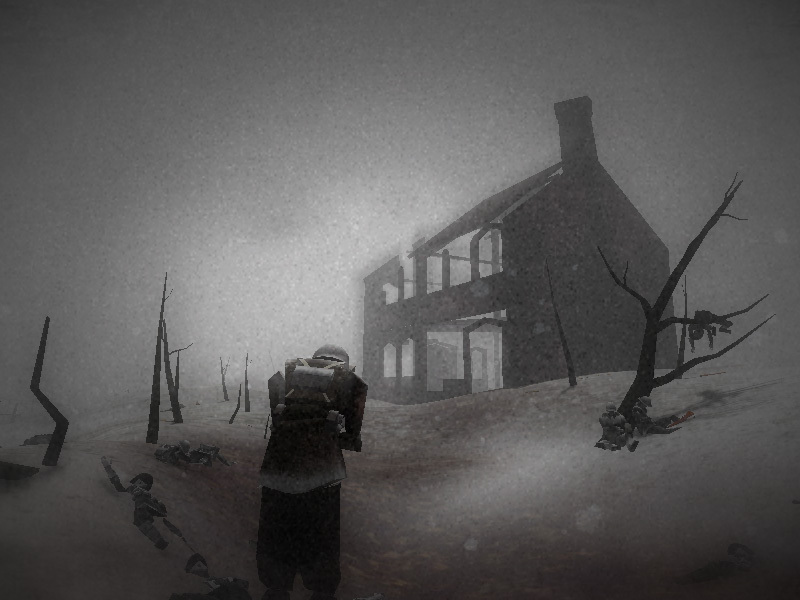 The game doesn’t tell you what you should be doing, though it hints at the possibility of interaction with others, and in the distance you see a figure wandering, moving back and forth aimlessly in the cold. There are a few objects scattered around – some sticks, a rifle that hints at the First World War, and a few discarded bottles. 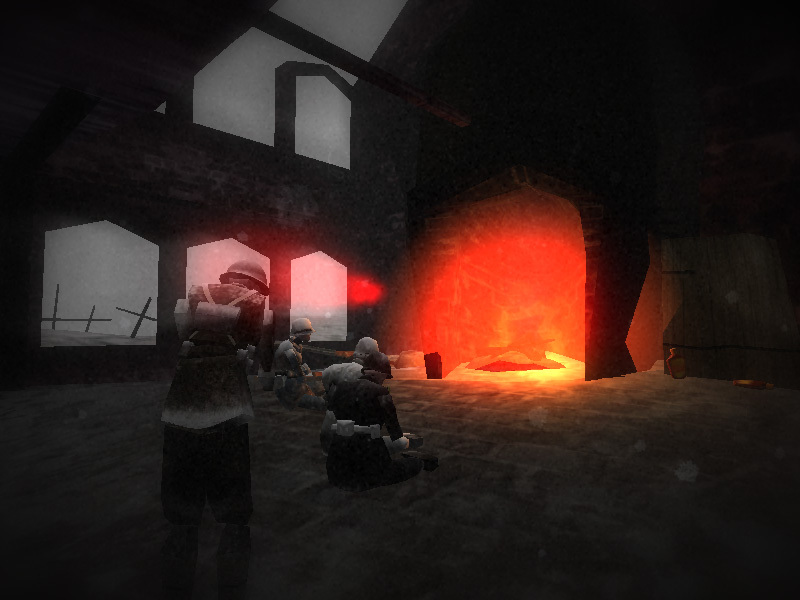 There is a warm, orange-toned fire roaring in the broken structure just ahead, and as you move towards it the soldier extends his hands to the flames for warmth. As you wander you see more soldiers. Some seem to need something, some seem to notice your presence, and some seem entirely lost. It’s all very minimal – the art-style is simple and unclean, the music nearly non-existent, and the only method of interacting with the other wanderers is by handing them something. As I walked towards one man he started repeatedly slurring out the word ‘Schnaps‘, and would only stop when I fetched him a full bottle of liquor. He sounded Germanic, but here’s really no indication of exactly where or when you are, or what side you’ve been fighting for. You look like you’re wearing the same uniform as the rest, but it’s so cold, and so dark, and so late, that no one seems to care much any more. Through the simple interactions and the blocky, unclean, but surprisingly appropriate visual presentation, I became attached to a plan. As I searched the land for the few survivors I began to convince them to follow me. I led them one by one back to the warmth of the barn, and to the startling glow of the fire. Every time I steered my soldier out into the cold he buckled over a little, and the screen became slowly more and more awash with white. It was difficult and genuinely nerve-wracking to go out each time. And every time I finally steered him back, with another person saved from the cold, I felt a little better. I don’t know if I found them all, in fact I’m sure I missed some, but it felt good to watch them all there, sitting quietly in the glow of the light of the fire. It’s incredible how real this world feels. In the course of just a few minutes I came to care about the fates of these digital constructs. These aren’t well-built characters that I’ve slowly grown attached to – they’re really just marionettes lumbering around a sparse stage. But the coldness and sense despair conjured by the sound of the wind, and the sight of a cold, dead landscape makes that stage feel like something much more. And this stage that the soldiers you interact with wander back and forth upon is so convincing that all their odd movements and actions seem like those of a broken, cold soldier lost on a battlefield. This entry was posted in Games Blather and tagged Singapore-MIT GAMBIT Game Lab, The Snowfield. Bookmark the permalink.